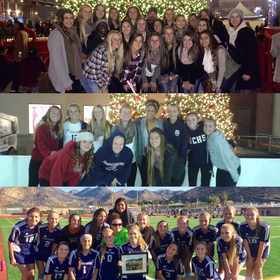 Steele Canyon High School Women's Soccer - Home of the 2010, 2011, 2012, 2013, 2014, 2015 Grossmont Hills League Champions! Welcome to the Steele Canyon High School Girls Soccer Team website. Steele Canyon High School is located in East San Diego County serving the kids of Jamul, Alpine, Rancho San Diego, El Cajon, East Spring Valley, and Campo. Please visit our Facebook and Maxpreps Pages for the most updated information!! Tryouts Begin November 14th 4:00-8:00pm. 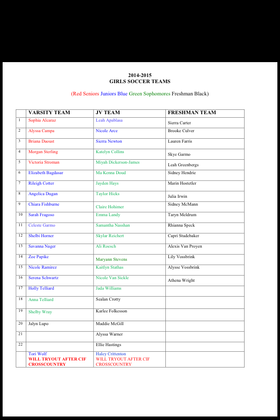 Making the team! What to do NOW!! COUGARS WIN CIF QUARTERFINALS IN DRAMATIC PKS!!!!!!!!!!!!!!!!!!!!!!!!!!!!!!! The Cougars and San Pasual battled for 80 Minutes of regulation and then 15 Minutes of Sudden Death Over Time and ended in 0-0! But in the PKS, the Cougars GK Holly Telliard saved the first two shots and SC never looked back as Elizabeth Bagdasar, Briana Daoust, Alyssa Campa, and Savanna Nager all made their shots to send the Cougars to the Semi-Finals on Wednesday! COUGARS TOP DRAMA OF QUARTERS, WIN WITH ONE SECOND LEFT IN OT! HEADING TO THE CHAMPIONSHIP GAME ON SATURDAY!! Living on the edge!!!!!! The Cougars and Rancho Bernardo fought to a 1-1 tie through reguation and it looked as though for 14:58 seconds of the 15 minute Sudden Over Time, it was going to end in a tie and the two teams would have to go to PKS. But with the whistle in the referees mouth, Briana Daoust raced to a ball in the right corner and crossed it beautifully to the middle of the box where Serena Schwartz fought with the keeper for the loose ball and ended up heading the ball into the net to send the overflow home crowd into a frenzy and the team storming onto the field for the sudden death win!!!!! COUGARS SHUTOUT VALHALLA AND WIN 6TH LEAGUE CHAMPIONSHIP IN A ROW! Cougars take Texas! National Elite Prep Showcase comes to an end! UT Article - Line Up takes shape for Steele Canyon! 2014 Vaqueros Tournament-FRESHMAN WIN CHAMPIONSHIP!!! After some truly gut wrenching decisions and an amazing tryout by the girls, we are proud to announce the 2014-2015 SC GIRLS SOCCER TEAMS. SCHS Parents meeting at 5:30pm in the gym, followed immediately by the Girls Soccer meeting in the Stadium. 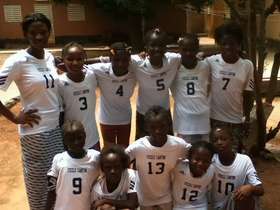 Cougars SC Uniforms reach Africa! 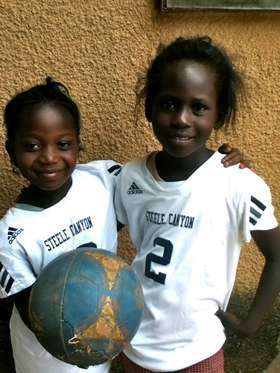 Through the efforts of the Peace Corps and our girls soccer program, a group of girls in the poverty stricken African nation of Burkina Faso are playing soccer for the first time and are wearing our donated Steele Canyon uniforms! Peace Corps volunteer Jessica Aceves (a former player of Coach Charlie's) stated that the girls in Burkina Faso, traditionally do not play sports, because they are for boys, but having the uniforms and last year's SC team picture are great motivators for the girls and cultural change although slow is happening in this far away Africa nation! Good Luck to our Steele Canyon Sisters!!! Cougars proud to announce Popeyes Chicken and Gorilla Service as Sponsors! Chelsea Jenner's Number 15 was retired tonight in front of a packed stadium of family, friends, staff, and teammates. Chelsea who passed away in a tragic car accident over the summer, will never be forgotten. In closing the ceremony, the Jenner Family was bought onto the field and circled by the Soccer team, and then 15 balloons were released in honor of Chelsea. Winning isn't everything, but the preparation to win is!